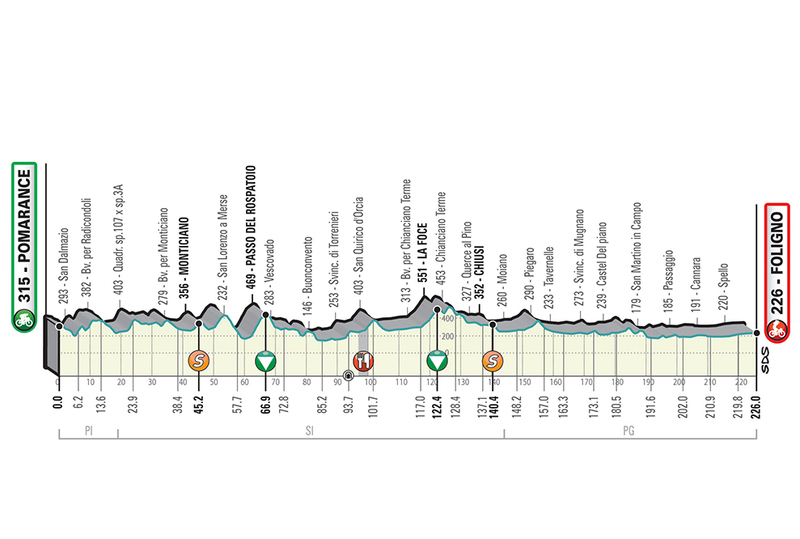 Hello and welcome to our live coverage of stage 3 of Tirreno-Adriatico. Today's largely flat 226km stage runs from Pomerance to Foligno. Today's stage is set to kick off in around 20 minutes. It looks like we'll see the first mass sprint finish of the race, unless the inevitable breakaway have something up their sleeve. The peloton will head to Umbria today, right in the centre of Italy. It's the longest stage of the race and features just two classified climbs, both coming relatively early on in the stage. Julian Alaphilippe (Deceuninck-Quick Step) won yesterday's stage on the uphill finish in Pomerance. He beat Greg Van Avermaet (CCC Team) to take his sixth victory of the season. Adam Yates (Mitchelton-Scott) took over the race lead. He's level on time with teammate Brent Bookwalter, and seven seconds ahead of third-placed man Primož Roglič (Jumbo-Visma). Today it should be one for the sprinters. Nacer Bouhanni (Cofidis) won't be contesting the stage, though. He finished the opening team time trial outside of the stage limit. Read more about that here. And the peloton will be setting off from the start right about now. Fabio Felline (Trek-Segafredo) is today's only non-starter. The Italian is suffering from knee pain. Bora-Hansgrohe's Peter Sagan will be looking to be in the mix at the stage finish today. The triple world champion has been recovering from an stomach virus. For more on that, read our story here. A break of six riders has already escaped from the peloton. Stepan Kurianov (Gazprom-RusVelo), Natnael Berhane (Cofidis), Mirco Maestri (Bardiani-CSF) and Sebastian Schönberger (Neri Sottoli-Selle Italia) are all back out front once again. Alessandro Tonelli (Bardiani-CSF) and Alexander Cataford (Israel Cycling Academy) are the other riders to make it. The gap between break and peloton is already up to five minutes. Tomasz Marczyński (Lotto-Soudal) has abandoned the race due to illness, the team reports. After 34km, the gap is up to 7 minutes. 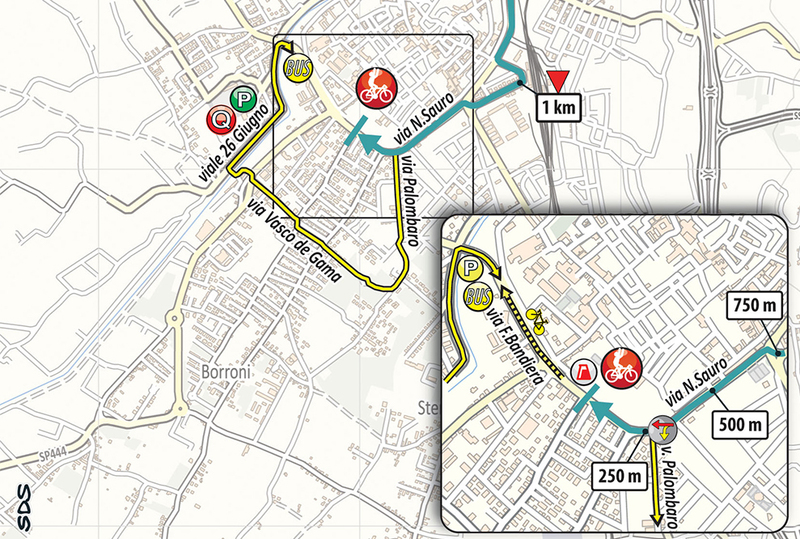 We're just over 10km from the first intermediate sprint of the day at Monticiano. Deceuninck-Quick Step are leading the peloton, and after just over an hour of racing the average speed has been 42km/h. The gap between break and peloton has now stabilised at around the six-minute mark. Kurianov, Maestri, Tonelli, Cataford was the order over the intermediate sprint at Monticiano. Elia Viviani (Deceuninck-Quick Step) looks to be the hot favourite to win today's stage should it come down to a sprint. The Italian already has three WorldTour wins to his name this season, at the Tour Down Under, Cadel Evans Great Ocean Road Race, and the UAE Tour. He spoke to Cyclingnews yesterday. Fernando Gaviria (UAE Team Emirates) is also in the mix, as is Peter Sagan (Bora-Hansgrohe). Other sprint contenders include Giacomo Nizzolo (Dimension Data), Greg Van Avermaet (CCC Team), and Sacha Modolo (EF Education First). Damiano Caruso (Bahrain-Merida) has abandoned the race. The first climb of the day, the Passo del Rospatoio (5.3km at 5.3%) is coming up soon. Stage 6 of Paris-Nice has recently gotten underway. You can follow that live too, here. The gap is down to two minutes now. No word on who took the points over the first classified climb of the day yet. An average of 39km/h after the first two hours of racing. The gap is stable at around four minutes at the moment. There's around 20km to run until the second and final climb of the day. Mitchelton-Scott are doing the bulk of the work at the head of the peloton at the moment. No surprise, given that their man Adam Yates is race leader. The riders reach the 100km mark and the situation remains the same with six men out front, around four minutes ahead of the peloton. Reinardt Janse van Rensburg (Dimension Data) is stopped at the side of the road, possibly a crash or puncture. With Maestri and Berhane in the break, the duo will be looking to secure leads in the points and mountain classifications respectively. One intermediate sprint and one classified climb remain on the stage. The break are approaching the second and final climb of the day at La Foce. Giacomo Nizzolo (Dimension Data) has hit the deck at some point. He's at the medical car getting his left elbow bandaged. That might affect his sprint chances later if it's a painful one. The break is 2km from the top of the climb. Berhane won the sprint over the top of the climb. He has 20 points in the mountain classification now, meaning the green jersey is his outright. 4:30 for the break now. We're inside the final 100km now. There's an intermediate sprint coming up soon and then... not much, a few lumps aside, until the finish. Nizzolo's elbow is bandaged up and his left shoulder is ripped, exposing his tattoo. He's riding at the back of the peloton alongside Steve Cummings at the moment. Quick Step and UAE have riders at the front of the peloton, with Mitchelton massed behind as they head down a descent. The order of the final intermediate sprint of the day was Kurianov, Maestri, Tonelli and Cataford. Maestri is now the provisional leader of the points competition. Maestri immediately drops back from the break, probably looking to save energy for future forays out front in a bid to contest the points classification until the end of the race. From a maximum of six minutes, it has since edged down to under four. At the moment, the peloton are 3:40 behind the break. Tom Dumoulin (Team Sunweb) is at the back of the peloton. Possibly returning from a mechanical issue. There's a long way to go though, so no panic. Tom Bohli (UAE Team Emirates) and Kasper Asgreen (Deceuninck-Quick Step) are still leading the peloton ahead of Mitchelton-Scott and Jumbo-Visma. There are no sprints or climbs to reward the break over the remainder of the stage, so it's pretty much a case of waiting for the kilometres to tick down until the peloton decide to reel them in foor good. After four hours of racing, the average speed has been 39km/h. The situation is still calm as we approach the final 50km of the stage. Dimension Data have sent a rider to the front. Either Nizzolo is feeling better after his crash, or Van Rensburg will have a go in the sprint. Inside the final 50km now and the break are still holding the gap at 3:45. Here's another look at some of the men who will no doubt be contesting the sprint at the end of the day. Elia Viviani (Deceuninck-Quick Step) looks to be the hot favourite to win today's stage. The Italian already has three WorldTour wins to his name this season. Fernando Gaviria (UAE Team Emirates) and Peter Sagan (Bora-Hansgrohe) are the other two big favourites. The Colombian will resume his UAE Tour rivalry with Viviani, while Sagan is recovering from illness. Other sprint contenders include Giacomo Nizzolo (Dimension Data), Greg Van Avermaet (CCC Team), and Sacha Modolo (EF Education First). Kurianov is the second man to drop back from the peloton after Maestri. Four left now. The remainder have three minutes over the peloton. 2:30 now for the break. The peloton look to be timing the eventual catch well. Quick Step have added another man to the head of the peloton in the shape of Zdeněk Štybar. Now the gap is down to two minutes as the riders reach the final 30km. They're speeding towards the finish now. 23km to go and the gap is just 1:30. It's just a matter of time for the break. It's Dimension Data, Quick Step and Mitchelton at the front of the peloton. There's a bit of a technical finish today, with a 90-degree left and sharp right just ahead of the flamme rouge, and then a sweeping right-hander 250 metres from the line. Positioning will be vital for the sprinters and their teams. Under a minute now for the break. Quick Step are driving the peloton onwards. It won't be long now until the break are reabsorbed. The peloton are have the remaining breakaway riders in their sights now as they reach the final 10km of this long, long stage. EF Education First have moved to the front. Sacha Modolo will be their option for the sprint. Attacks in the break as they try and hold on for as long as possible. Cataford is the last to reply but they stick together. Schönberger is the most aggressive in the break, attacking twice so far. Three distinct trains emerge at the head of the peloton – Quick Step, Mitchelton and EF. It's almost over for the break. A final try for Schönberger. He's the last man standing from the break, but they're all brought back by the peloton. Team Sky have moved to the front, protecting their GC rider Wout Poels as they head to the 3km mark. AG2R La Mondiale take the lead, somewhat surprisingly. Bora-Hansgrohe and Dimension Data take over. Viviani is further back. He's on Gaviria's wheel. Viviani and Gaviria move up into the top ten. The peloton hits the final kilometre. A number of teams are up front, with no trains organised at this point. Around the final bend and Sagan launches the sprint! Viviani comes off his wheel in the final 200 metres and sprints by! It's another win for Elia Viviani. Fernando Gaviria (UAE Team Emirates) took second, edging ahead of Sagan in the final metres too. The Colombian stuck to Viviani's wheel and nipped Sagan on the line. 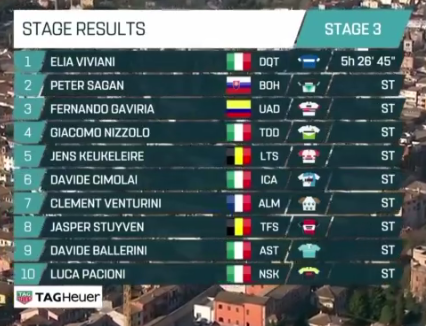 It's stage win number four in 2019 for Elia Viviani. The Italian champion also won the points classification at the UAE Tour. That's Deceuninck-Quick Step's second win in two days at Tirreno-Adriatico. That makes it 17 in 2019. Turns out Gaviria just lost out to Sagan on the line. He finished third today. Here's the top ten on the stage. The GC remains unchanged, with Adam Yates (Mitchelton-Scott) retaining the blue jersey ahead of teammate Brent Bookwalter and Primož Roglič. Peter Sagan has been recovering from a virus, so a very good showing from him on such a long stage, considering that Milan-San Remo is fast approaching. That's all from us today. Be sure to visit again tomorrow for our live coverage of stage 4!